Some Highlights from the October 2017 Commissioners’ Information Meeting on the Mountain West Transmission Group — Dietze and Davis, P.C. On October 20, 2017, the Colorado Public Utilities Commission (“PUC”) held a Commission Information Meeting regarding the application of the Mountain West Transmission Group (“MWTG”) to join the Southwest Power Pool (“SPP”). This meeting covered an overview of the SPP and the MWTG, the transmission planning process, the SPP process related to integrating new members as well as to modifying SPP governing documents, and the projected timeline and next steps for the process. The MWTG is a coalition of 10 electricity service providers with about 6.4 million customers and 16,000 miles of transmission lines in, mostly in the Rocky Mountain region. It includes Basin Electric Power Cooperative, Black Hills Energy, Colorado Springs Utilities, Public Service Co. of Colorado, and Tri-State Generation and Transmission Association. Xcel Energy's Denver operation is also a member. MWTG formed and began discussion on the creation of a Regional Transmission Organization (“RTO”) in 2013. Among the many options considered—from joining another RTO to the creation of their own—the members generated the most consensus on joining the SPP. The organizations are now in the process of integrating Mountain West into the SPP as well as applying for approval of the integration with the appropriate state and federal entities. Presenters highlighted the 5 phases of integration: (1) initial discussions, (2) due diligence and membership agreement discussions, (3) open-access transmission (“OAT”) tariff negotiations (which includes proposal and modification of governing documents like bylaws), (4) FERC and state approval, and (5) actual integration. The parties are now engaged in phase (2) and (3), which is has been slow between the 95 SPP stakeholders. MWTG and SPP have set a tentative date for full integration by October 2019. They also referenced the website created to provide information on the integration process and briefly outlined how members, customers, market participants or regulators could submit questions, commentary, and suggested revisions to the tariffs and governing documents. Members of SPP and MWTG also presented an outline of the proposed transmission plan. They first explained “pancake pricing,” and the consequences of eliminating pancakes in an RTO. Pancake pricing occurs when a transmission customer is charged separate access charges for each utility service territory crossed by the transmission customer's power transaction. “Pancaking” increases the price of electricity and discourages competition in the generation sector. By combining transmission systems under a single RTO like the SPP, a wider area served by a single rate can be designed, thus eliminating pancakes. However, this elimination will generate cost-shifts across the MWTG region, and the parties are still negotiating the terms of the agreement around mitigation of these cost-shifts. The presenters also emphasized that under the SPP, project selection will alter to consider a broader scope of benefit. While local planning will remain important, SPP will also perform a regional evaluation (for the east and west, respectively) of each proposed project to determine their overall costs and benefits to that region. Thus, a project that has a large benefit locally, but little benefit regionally, may not be approved under SPP protocols when compared to a project with less local benefit but a greater overall benefit. The SPP will also introduce a new model for cost allocations of such projects as well, which will scale costs related to local and regional benefits and project size. The parties continue to negotiate on the details, but the presenters assured that the project selection and cost allocation processes will not include those projects that are necessary to ensure transmission reliability in the region. The parties also discussed governance models under the SPP. 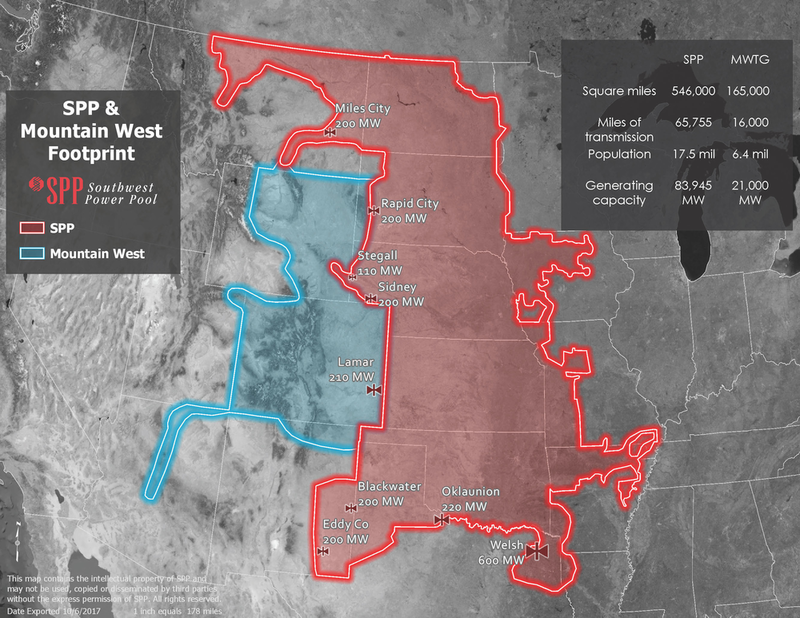 MWTG’s primary change to the SPP model would be to include more seats on the boards and working groups so that Colorado’s west slope would be adequately represented in the decision-making process. For example, certain deal terms would require consent from western transmission owners by majority vote before they could be changed, and western transmission owners would have more input on proposals that would alter the nature of the RTO. Representatives also presented on the upcoming regulatory issues related to FERC and state filing of MWTG’s application to join the SPP. The projected filing deadlines were all based the October 2019 integration rate. Given the importance of the FERC process and its potential to confront and resolve application issues that would arise at the state level, the MWTG decided to file with FERC first before going to the state, so that the federal processes and outcomes could be incorporated into the state filing. The MWTG mentioned that its discussions with FERC are still mostly informational, but that this filing will be one of the most significant to come to FERC in recent memory due to its size and its multi-jurisdictional aspects. FERC has expressed preliminary concerns with the transition process as well as its ability to issue compliance orders to the SPP. MWTG closed by highlighting their bottom line: despite the costs, the process represents a diverse and broad perspective of entities seeking integration, which demonstrates its value. MWTG also identified its next steps: namely, the filing processes with the FERC, future meetings related to the integration and its ability to uphold Colorado’s constitutional mandate to expand renewable energy, and the state and the issuance of a detailed cost-benefit analysis.